The Nationals make their first trip to Philadelphia this season for a three-game series with their NL East rival. These teams met last week for a two-game series in Washington D.C. that was split. Anibal Sanchez makes his second start of the season after he was pulled early last week after taking a liner off of his upper leg/hip area on his left-side. For the Phillies, they will go to Vince Velasquez to start this game. He is seeded as the Phillies’ fifth starter, and this will be his first start of the season. If you believe in analytics, Howie Kendrick is recently 4-for-7 against Velasquez with 2 home runs, and Ryan Zimmerman is 5-for-his-last-12 against the Phillies pitcher. That shows that there are some reverse splits, but some righties have struggled against V.V. like Anthony Rendon. Maybe with as hot as Rendon has been lately, it won’t matter as Tony Two-Bags has been touching Four-Bags a lot recently with four home runs along with a .433 batting average and a 1.495 OPS. With Anibal Sanchez, he dominated the Phillies last year in their home park at a slash of .158/.273/.211/.483 and you only hope that the veteran pitcher can replicate or even better those stats today against the Phillies. 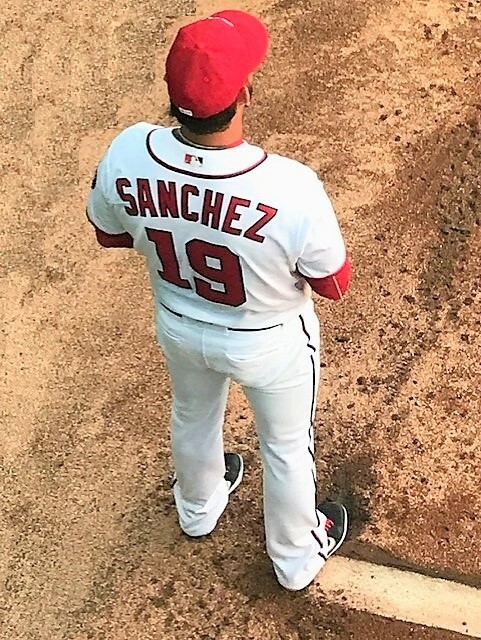 This is Sanchez’s fourth consecutive start where he has faced the Phillies dating back to the 2018 season. Roster Moves: RHP Dakota Bacus promoted to Fresno AAA. LHP Jordan Mills to Harrisburg AA from Extended ST. INF Adrian Sanchez optioned to Harrisburg from #Nats. INF Luis Sardinas placed on the injured list. Michael Taylor was reinstated by #Nats. Andrew Stevenson to Fresno AAA. Brian Dozier is back in the 2-hole and Howie Kendrick who has impressive numbers against Velasquez is not in the starting line-up.